Matthew Coley charges forward. Photo: David Dales. Boston Rugby Club’s second Midlands 4 game of 2017 ended in defeat, as East Retford completed the double over the Blue and Whiteswith a 22-5 success. The side welcomed prop Jo Deamer, back row Luke Fowler and centre John Stanfield into the squad. From a five metre scrum, Boston made a perfect start after five minutes - scoring a well-executed number eight pick-and-drive by Lewis Eldin. It took East Retford some time to get back into the game, and when the sides entered half time the score was 5-7 in favour of the visitors. The second half saw Boston again start positively and, like the previous 40 minutes, they had opportunities to score. A combination of wrong options taken and a lack of composure would see the home side fail to record any more points. 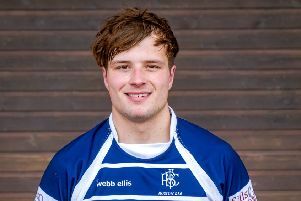 East Retford scored three additional tries to seal the win. An area where Boston need to improve is in relation to their discipline at the break down, where they conceded numerous penalties through out the match. On Saturday the team travel to play Long Eaton (KO 2.15pm). BOSTON: Lane, Scott Deamer, Hardstaff, Colley, Eldin, Starkey, Fowler, Chapman, Kippax, Cook, Stanfield, Moody, Cook, Baldwin; Replacements: Phoenix, Baldwin, Turley, Richardson, Cuthbertson.